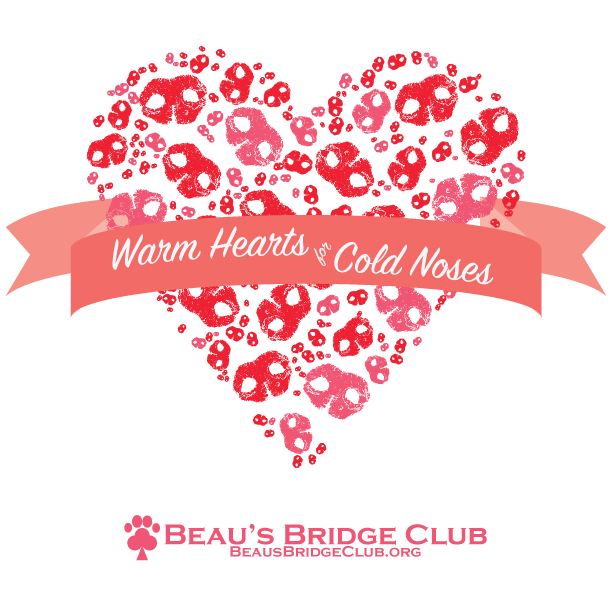 This Valentine’s Day season, we are asking if you have a warm heart for the cold noses who need your help? Every day animals all over the world are at risk and Beau’s Bridge Club wants to be part of the change. Unfortunately, since love isn’t a currently recognized currency, we need your help! As most of you know, we are just getting started and we’ve already helped in many ways including fostering puppies, helping SJ find a home, and giving Honey the care she needs, but we’d like to do more! We’ve taken a chunk out of our rescue funds to provide help to these animals and we’d love to replenish. Furthermore, we’d like to have the flexibility to do more. We want to help more puppies and kittens get the care they can’t from the traditional shelter system. We want to get at-risk animals out of the shelter and into a home with a family who adores them. We want to make sure that no pet parent has to make the tough decision of choosing whether their animal will have to suffer based on funds alone. We want to help and, until we can use puppy poop as payment, we need your spare change! Luckily, we know there are a lot of people like you (Yes! You! Reading this right now!). We know that your heart is big and warms every time you see a happy story of an animal who was able to get out of a sticky situation. Your heart hurts every time you think of those animals who can’t get help. Your heart probably belongs to a couple cold nosed creatures you share a house with and you could never imagine your life without. Give your Valentine’s Day more meaning. Make your heart feel good. Donate in honor of your own valentine (drop us a line to let us know who you are donating for and we’ll even send you a printable card). Be a Warm Heart for Cold Noses and help us help them. Please donate to replenish what Honey’s care required and hopefully surpass it so we can help more animals in need. If you prefer PayPal, feel free to donate here.